Aardvark (Orycteropus afer) is the common name for a species of burrowing, heavily built, insectivorous mammal found in Africa. Also known as antbear, the aardvark has a long slender nose, big rabbit-like ears, and a rat-like tail. It is the only extant species in the order Tubulidentata. 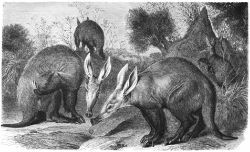 The aardvark has an unusual appearance. Knöthig (2005) states that people who see an illustration of the animal for the first time often think it is a made up animal, like a jackalope, or perhaps a prehistoric creature. Particularly, this is true of the baby aardvark: "it resembles the alien creatures known from science fiction and people would believe it is a creation of the Hollywood film industry." The aardvark's unique appearance and behavior adds to the human wonder of nature. Aardvarks also provide ecological values, being considered by many to be a keystone species in various ecosystems. This is not simply because of their role in food chains—converting ant and termite biomass into a form usable for top predators like lions, leopards, and pythons—but also because their abandoned burrows are utilized by innumerable other animals. Well-known in English-speaking countries due to its being the first animal in the alphabet, the aardvark otherwise is not well-known outside of areas in which it resides (Knöthig 2005). The name comes from the obsolete Afrikaans name for "earth pig" (aarde earth, varken pig), because early settlers from Europe thought it resembled a pig. However, the Aardvark is not closely related to pigs, being placed in its own order. The common term antbear generally is also considered confusing, since the term generally refers to anteaters of the family Myrmecophagidae, but the aardvark is not closely related to anteaters, despite the common diet of ants and termites. The most distinctive characteristic of the Tubulidentata is (as the name implies) their teeth. Instead of having a pulp cavity, Tubulidentata teeth have a number of thin tubes of dentine, each containing pulp and held together by cementum. The teeth have no enamel coating and are worn away, regrowing continuously. The aardvark is born with conventional incisors and canines at the front of the jaw, but these fall out and are not replaced. Adult aardvarks have only molars at the back of the jaw. The aardvark is only vaguely pig-like. The body is almost hairless, with sparsely scattered coarse hairs, and it has a strongly arched back (AWF 2007). The legs are short, with the hind legs longer than the front legs (AWF 2007). The front feet lack the pollex (or "thumb")—resulting in four toes—but the rear feet have all five toes. Each toe bears a large, robust nail, which is somewhat flattened and shovel-like, and appears to be intermediate between a claw and a hoof. The ears are disproportionately long, and are normally held upright, but can be folded and closed while tunneling and can be moved independently (AWF 2007; Knöthig 2007). The muscular tail is very thick at the base and gradually tapers. The greatly elongated head is set on a short, thick neck, and the end of the snout bears a disc, which house the nostrils, which can be closed. The mouth is concealed by the swollen upper lip and is small and tubular, typical of species that feed on termites. The aardvark has a long, thin, protrudable tongue, and elaborate structures supporting a keen sense of smell. An aardvark's weight is typically between 40 and 65 kilograms, but weights of 100 kilograms have been measured (Knöthig 2005). The total length without the tail is commonly between 1 meter and 1.6 meters, with a tail length of 45 to 80 centimeters (Knöthig 2005). The shoulder height is about 60 to 65 centimeters (Knöthig 2005). The aardvark is a pale, yellowish gray in color, often stained reddish-brown by soil. The coat is thin and the animal's primary protection is its tough skin; the aardvark has been known to sleep in a recently excavated ant nest, so well does it protect them. Aardvarks live south of the Sahara Desert, where there is suitable habitat for them to live. Aardvarks live in African savannas, grasslands, woodlands, and bush. They are not found in deserts but are found in places where there is an abundance of food supply (ants and termites). Aardvarks dig burrows (holes in the earth) as homes. They prefer sandy or clay soil and if the soil is too hard, they will move to areas with easier to dig soil (AWF 2007). Some authorities recognize two species of Orycteropus: O. aethiopicus (in central and eastern Africa) and O. capensis (southern and western Africa), but generally these are seen as subspecies (O. afer aethiopicus and O. afer capensis). The number of subspecies is unsettled. Knöthig (2005) notes that as many as 15 to 18 subspecies have been described, but considers these to be invalid because they have been based on single individuals and because of the wide variability within populations in such aspects as snout proportions and angle. The aardvark is nocturnal, solitary creature that feeds almost exclusively on ants and termites (formicivore); the only fruit eaten by aardvarks is the aardvark cucumber. Because of its solitary, nocturnal nature, aardvarks are rarely seen, and few are kept in zoos worldwide (Knöthig 2005). Aardvarks are excellent burrowers, using their thick claws on their forefeet. They may dig new burrows almost nightly, particularly when it rains (AWF 2007). The aardvark may have temporary sites scattered around the home range as refuges, and a main burrow used for breeding. Main burrows can be deep and extensive, have several entrances, and can be as long as 13 meters. Only mothers and young share burrows. When attacked, an aardvark may quickly dig a hole; if attacked in the tunnel, it will seal the tunnel off behind itself or turn around and attack with its claws. When attacked in the open, it may roll on its back to defend itself with its large claws or it may somersault away using its large tail (AWF 2007). One of the reasons the aardvark is considered a keystone species in the ecosystem is because abandoned aardvark burrows are used by many mammals, birds, and lizards. Although aardvarks will sometimes exit their burrow during the day to sun themselves, they typically sleep during the day, blocking the entrance to their burrow, leaving only a small opening (AWF 2007). When one exits a burrow in the evening or late afternoon, it typically is very cautious, first standing at the entrance motionless for several minutes and then suddenly leaping out in powerful jumps (AWF 2007). When a concentration of ants or termites is detected, the aardvark digs into it with its powerful front legs, keeping its long ears upright to listen for predators, and takes up an astonishing number of insects with its long, sticky tongue—as many as 50,000 in one night have been recorded. Aardvarks pair only during the breeding seasons. They give birth to one offspring at a time, which is pink, hairless, and stays inside the burrow for about two weeks (AWF 2007). The young aardvark travels with the mother after two weeks, is suckled until four months old, and eats its first solid food at three months of age (AWF 2007). Young female aardvarks will stay with the mother until the next baby is born, and even then may dig its own burrow only a few yards away, whereas the young male is independent at the age of about six months (AWF 2007). The aardvark's main predators are humans, lions, leopards, hyenas, and pythons. Aardvarks can dig fast or run in zigzag fashion to elude enemies, but if all else fails, they will strike with their claws, tail, and shoulders, sometimes characteristically flipping onto their backs or somersaulting away, as noted above. Their thick skin also protects them to some extent. African Wildlife Foundation. 2007. Aardvark. African Wildlife Foundation. Retrieved September 14, 2007. Knöthig, J. 2005. Biology of the Aardvark (Orycteropus afer). Ruprecht-Karls-Universität Heidelberg (Ruprecht Karl University of Heidelberg. Retrieved September 14, 2007. Lindsey, P. et al. 2006. Orycteropus afer. IUCN. Retrieved May 11, 2006. Schlitter, D. A. 2005. In D. E. Wilson and D. M. Reeder, eds. Mammal Species of the World: A Taxonomic and Geographic Reference, 3rd edition. Baltimore: Johns Hopkins University Press. ISBN 0801882214. This page was last modified on 20 January 2019, at 17:05.